As usual the university initiates as a human institution namely and as an educational and cultural institution secondly in supporting civilization and human heritage to be the sponsor and the supporter for all major projects in the service of man and society, and from its educational platform, it implants trust among all when addresses many important issues in society, so nowadays when our monuments have been robbed by gangs and imperialist countries, we find that many of the museums of other countries that allegedly support the international security are filled with monuments of other countries and they boast publicly of that looting. Let our scientific institutions and express their historical responsibility in the preservation of the civilized heritage and antiquities that represent the symbol of knowledge, culture and civilization, as described by Irina Bokova during the campaign she launched entitled “unite for heritage” in our prestigious university, to formally announce the birth of a new union starting from the university of Baghdad to collect antiquities and human heritage in the world. 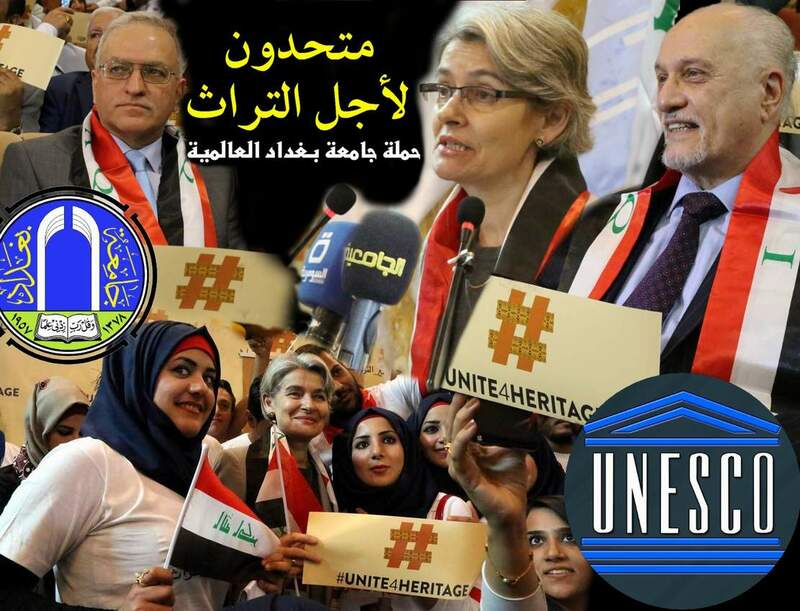 In a scientific demonstration of the university of Baghdad, especially in the college of arts, department of antiquities, a great worldwide campaign was launched entitled “unite for heritage” that was attended by the minister of higher education and scientific research, prof. Dr. Hussein Shahristani, the Secretary-General of UNESCO, Ms. Irina Bokova, prof Dr. Alaa Abdul Hussein, president of the university, also attended by Mr. Adel Shershab, minister of tourism, several deans of faculties and students at the department of archaeology. This campaign was prepared for by university of Baghdad in collaboration with the UNESCO and its representative in Iraq. The team of the university website accompanied the demonstration, documening it with videos and photos. For the purpose of keeping up media development and scientific activity, where the University holds a large amount of activities and media events at the university every day which led to the expanding and deepening of the media work, therefore the university plans ,and in accordance with the strategic perspective, to create media cadres of high professionalism, including the establishment of the training course of making reports and television programs for officials of Al-Jami’ya satellite station’s offices in the Ministry of Higher Education and Scientific Research, which has been held under the auspices of Prof. Dr. Alaa’ Abdulhussein ,president of Baghdad University , at the Central Library Hall in Baghdad University .It has lasted more than two weeks including the curriculum and the lessons of theory and practical, as well as laboratory applications of digital media technologies. Director of the Al-Jami’ya channel Office Prof. Dr. Abdulbassit Salman has organized the course and in coordination with Mr. Administrative Assistant Professor Dr. Riadh Khalil, who provided adirect support to establish the course and has attended the meetings of the preparations and the settings of the course for two successive months. The course has included intensive training programs and senior and scholars of media and television specialist has been participated including Prof. Dr. Matthew Paul professor of television programs , Dr AbdulKhaliq Shaker professor of cinematography , Dr. Suhad Al-Qaisi, a professor of public relations , Dr. Ahmed AbdelAal , the ex-University Director of Information , Dr. Mohamed AbdulJabbar , professor of Montage Film , Ms. Marilyn Ishu ,professor of recitation and sound and television broadcasting , as well as Prof. Hamid Zughayyar , General manager of Al-Jami’a satellite channel .The participants have been provided with brochures and programs of curriculum of the training course for free. On the first day of the course, Dr. Suhad Al-Qaisi has delivered a lecture in writing television text entitled “Pedagogy of media discourse” and has discussed the importance of pedagogy in writing television text and how to convey the information to the recipient and methods of persuasion .The lectures included discussions with many questions about the foundations of media development and how to deal with various layers of society and how to write a report that goes with what its objectivity. 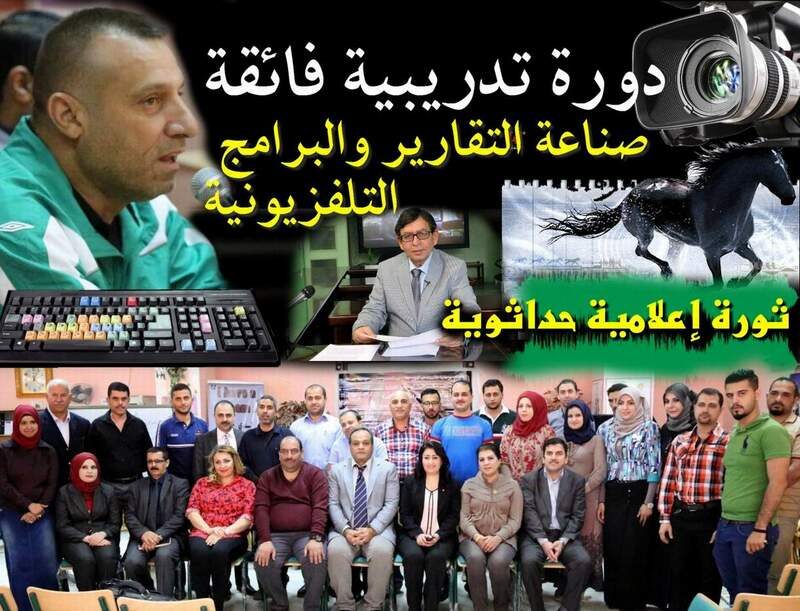 Then Dr. Abdul Bassit Salman has conducted practical applications of television text writing. On the second day Professor Hamid Zughayyar has delivered a lecture on the successful television program specifications, during the lecture Dr Abdulbassit has participated in employing techniques to prepare TV programs as well as creating mechanisms on the preparation of reports and successful television programs . Professor Hamid has presented the ways to conduct a report and the successful program and the competition in the era of the large number of satellite channels and how to keep the audience feeling entertained , expressing his great delight of this elite of the participants and his hope to upgrade the media level of Baghdad University and Al-Jami’ya Channel in order to provide a nice picture about the educational level of the university and to cover activities in the corridors of the university. Professor of Film Montage, Dr. Mohammed AbdulJabbar has presented a theoretical and practical lectures of filming montage and chipping photographs for reports and news programs, and has explained how to work and install the report or TV program with an explanation of how to work on “Adobe Premiere software” (Adobe Premiere) explaining in details all the processes and mechanisms of this global Montege program where the world largest media organizations follow in the montage of news reports,and television programs . Dr. Abdulbassit has conducted and in line with the theoretical and practical lectures an implementation of virtual TV report and has implemented directly in front of the participants to learn the secrets of the profession. TV media professor and program broadcasting Marilyn Esho has provided theoretical and practical lectures of the characteristics and skills of the broadcaster and has dealt in details the explanation of the importance of broadcaster and his major role in the success of the TV report, programs ,his qualities and skills that qualify him and she has stressed the importance of preparing before entering the studio and the big idea and knowledge of the dialogue that is going on between the broadcaster and the guest to know the guest’s personality and organize the time of the dialogue. Then the participants have been taken to the fields of productive and satellite broadcasting, where Dr. Abdulbassit Salman has escorted all the participants to the studios of the college of Fine Arts and Al-Jam’ya channel, in a scientific and practical trip , and has met the leading artists and media professionals and specialists in television, including Prof. Dr. Matthew Paul, who delivered a lecture at directing , Dr. Adel Shakir who explained the origins and traditions of filming media work and according to international standards, as well as Dr. Ahmed Abdelaal briefed on the mechanics of the output of directing and media display . Dr. Mohammed AbdulJabbar has conducted in professional montage studios of the College of Fine Arts the applications, the lectures also included practical applications on the boards of studio keys, TV. cameras and equipment of the picture and photosynthesis blending .The participants also has also met Al-Jam’ya channel Professor AbdulJalil, engineer and Montier and director Ihsan al-Fadhli, as well as General manager of the channel Professor Hamid Zughayyar as well s Mr. Ahmed the coordinator director of the channel with some broadcasters. In a practical application to broadcast a virtual television news with cameras and equipment of Al-Jam’ya channel, after reviewing all the devices and technologies in the studiosl with clarification and explanation of how to work within the studio and dealing with technology and television equipments, and was also explain the traditions and norms of professional followed in the work of the channel. Many interested people, in particular leading figures in education follow successes achieved by our university through its recent excellence on all Iraqi universities and on more than 23650 international universities and they are keen to support the university to remain as a focus of pride for all Iraqis and only for members of the university that emits hope and optimism towards glory intended by our solemn government to create a decent life with the educational power we have that competes other world educational institutions. 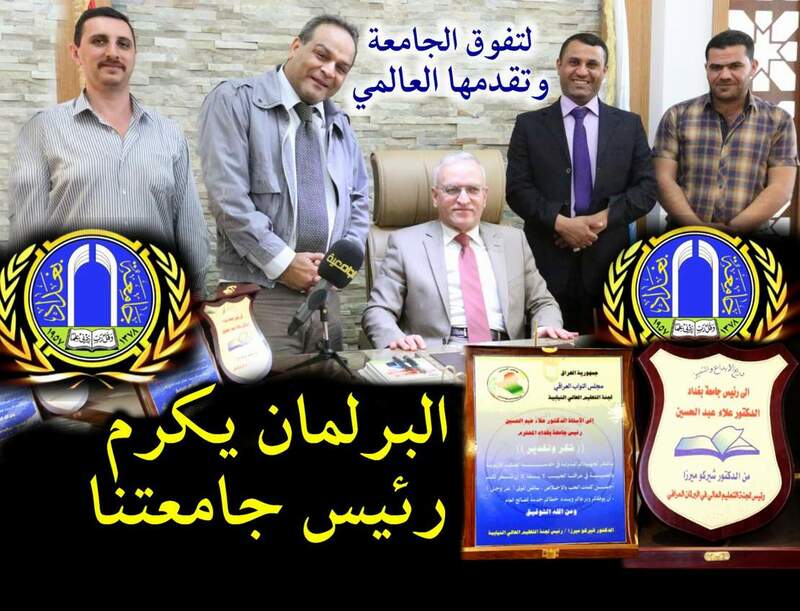 Yet, with more congratulations and many blessings, the education committee of the Iraqi parliament considered honoring our university president, prof. Dr. Alaa Abdul Hussein who dedicated the concept of excellence and superiority of the university with a number of data achieved and for his active role in many research and practical areas, his distinguished activities, university management in a super academic shape and what great university achievements attained during the recent period. Prof. Dr. Alaa Abdul Hussein, during his meeting with website team and the university channel office asserted that this honor represents a triumph for Baghdad university where the efforts and keen of its members are the basis of which, in line with attaining advanced ranks by our prestigious university that had graduated great thinkers, scientists, political leaders and intellectuals, and our quest today is to exert more efforts, diligence and sincerity foremost for our Iraqi community and our beloved homeland. Mr. president stated that the university strategies developed carry more serious data in excellence and that our efforts, particularly the scientific ones are still outstanding compared with other Iraqi, Arab and Middle East universities, but this does not mean that we tolerate with exploiting opportunities for more advanced positions, on the contrary, we should have the incentive to exert more exceptional efforts to draw a bright picture of our country. It is worth mentioned that parliament has honored the university president for his creative activities, distinguished work in particular his academic and scientific researches published in international journals with impact factor, as well as his contributions in many events in service of community. The university has excelled in many world forums such as its entry into the encyclopedia of Guinness that proved to the world that the university of Baghdad has potential beyond what the world might think in a time where political challenges faced in country such as war, siege and occupation, adding that what the university achieved during the past period represents that actual reality of the Iraqi man and his constructive ideas, so that the Iraqi minister of higher education and scientific research, Dr. Hussain Al-Shahristani when addressing UNESCO general secretary stated that the Iraqi man is the first who had created the wheel, planted wheat in the world, invented writing and taught humanity civilization that extends to more than six thousand years. Al-Khawarizmi college of engineering organizes a symposium on automation and its importance in industrial development. University of Baghdad holds a scientific symposium on shrines and religious mausoleums in Baghdad. A novel in English was issued by an instructor at the college of languages. Master thesis in engineering discusses the optimal operating of “Ataturk” Turkish dam. Department of Spanish language holds a symposium on violence and dominant Western media. Department of surveying engineering at the university of Baghdad conducts a field survey in al-Qishleh archaeological site. University of Baghdad organizes its 4th forum of e-learning with the participation of several companies and specialized international offices. Baghdad university organizes a concert on the occasion of graduation of the 56th session of students of petroleum engineering department. Various musical festivals of the department of university sport and art education at the university of Baghdad. Investment of electronic technologies and their impact on interactive text.